Under the introduction of Food Designer, Xiaoman Chen (Slow Chen), I came to W&M Workshop in Zhongshan District, Taipei. "I hope to introduce one of your favorite baristas, and this barista has not been overexposed in the social media." When I wrote to Xiaoman, I sent this wish arbitrarily. W is the director of W&M Workshop, and his twin brother, M helps him in the store. A few years ago, W was diagnosed with heart disease by a doctor and had a heart transplant in the fall of 2015. At the same time, M resigned from a full-time job to take care of W. "W&M is a symbol to commemorate. We are family and friends forever." On the day of the interview, W was dressed in beige and explained to me at a slow speaking speed. W has always been in the service business and often has the opportunity to get in touch with customers. In the past, when he associated with customers, he often felt exhausted. "I was like a psychiatrist and gave counseling to others. But do you know? We also need to be cared for and taken care of; then where do I get the need?" Since he is suffering from heart illness, he has changed his mind and attitude, especially during the period of staying in the hospital. He had the feeling of being broken and reconstructed. It was also during that period that W read a lot of books and gained warmth and strength from the text. After the heart transplant, the doctor said that even if W recovered well, it would never be possible to restore to the normal state of health. Therefore, to adjust the mood and to find a balance between work and life are necessary after surgery. In the past, he was impatient. He pursued good results in his work, and the overly urgent attitude would easily offend others because he never had the opportunity to slow down and think about how to operate things smoothly. Of course, after being sick, he must slow down, and then treat people with different perspectives. "I don't just look for a smooth way to get things done, but also remind myself that I want to be kind and have positive thoughts." As long as you think about others, you will not harm others. However, W said that to have good faith is actually for himself. By improving his behavior to become a better person, this is good for the body, mind and health. At the same time of slowing down the pace of life, W also omits the things that are unnecessary and not urgent to save his energy. If we have always been giving, then we have to learn to be the one who can take care of ourselves and care for ourselves. "It's unpleasant to be unhealthy, so I have to be selfish to make myself fit so that I can live. And then, I have the opportunity to make everyone good. Otherwise, my brother and family around me would also be suffered." W's younger brother M is engaged in financial work. After W's illness, M resolutely left his job and took care of W while sharing W's responsibilities and duties in life. We do not easily understand the feelings between twins. They have lived together for such a long time, and the accumulated understanding and induction are connected. Well, is it okay to have a break in oneself's life and first help the brother to continue his life? "I have made my mind before, and I never thought about not to support my brother." M also answered me with a slow talk. Before the interview, W said that he would interview with me and M would be on the sidelines but not joining us. In the interview, M sat in the corner of the cafe and listened quietly to our conversation. When the topic extended to him, he occasionally expressed his ideas. "Here (the cafe, W&M Workshop) is my source of nutrients. When I slowly recover, he (M) is going to return to his career. I can arrange my work. No problem." The appearances of the twins are different, but if you look closely, you will find that the facial features are similar. After chatting with both, you will slowly feel the homonym of them. I secretly thought about it, when W was sick, was M's heart also hurt? W used to be a sommelier. When he was working in restaurants, he had opportunities to know about Italien style coffee. He had basic skills and knowledge on how to brew espresso or cappuccino. After he was ill, he couldn't taste wine because of taking medicine, so he dedicated to researching coffee (Single Origin). There is not much overlap between the coffee and the wine consumer groups. Because of alcohol, most people still drink coffee more than wine in their daily lives. However, there are many commonalities between coffee and wine, such as color, temperature, origin and manufacturing processes. The flavor of the wine is stronger than the coffee, but the brewed coffee is also very delicate and intriguing. When introducing coffee, W likes to let the guests know in a way that is easy to understand and easy to imagine. For example, some coffee has an orange taste like osmanthus or magnolia, which tastes warm and sweet. Also, not only the flavor but also the aroma; for example, one coffee has the smell of a white flower, while the other coffee has red and purple flower aroma, like the smell of roses or violets. Also, some have aromas of strawberries or nuts, which are similar to wines. There is still a distance between a hobby and becoming a professional. How does W accumulate skills and knowledge to take it to the next level? 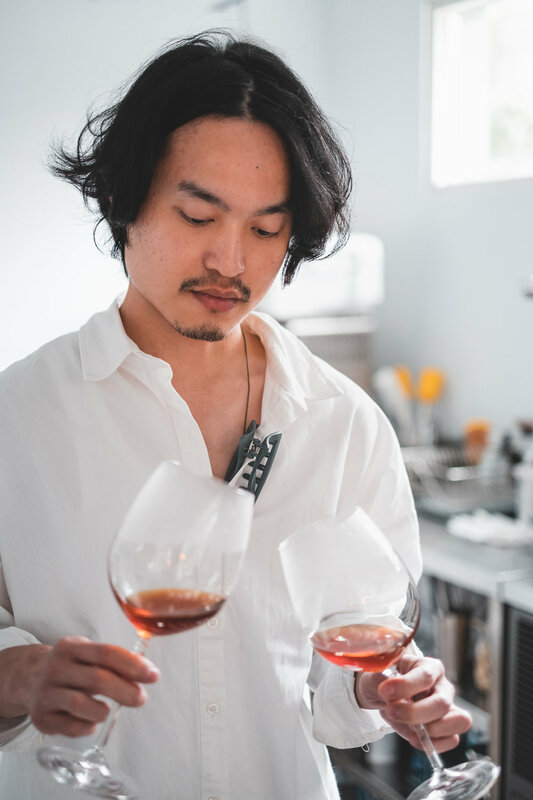 In addition to continually learning new knowledge, he also collects a large number of experiments and tests to gather the strength of brewing coffee. For W, the correct way to brew coffee refers to use the most appropriate system to bring out the most original and pure flavor of coffee. Therefore, he has repeatedly tested the thickness of the grinding, the temperature of the water and the choices of the filter to accumulate the best brewing data. "It is undeniable that the experience as a sommelier gave me a lot of help. I use the way of tasting wine to taste coffee so that I can build my coffee philosophy systematically. At the same time, I certainly understand the flavor and taste of each coffee." In terms of coffee taste, W hopes to convey to the guests not only about good or not good. Of course, after the new wave of coffee culture in Taiwan, many people know how to taste coffee, but W uses an imaginative introduction to explain more about the flavor and the story of coffee. "Most of us like coffee, but we don't have the opportunity to understand. Many times we have a cup of coffee, but after half an hour we probably forget the taste and fragrance of it. I hope to give every guest an impressive memory about their cup of coffee." W then introduced me to the subtle differences between different coffees. The Washed Process makes coffee lighter and brighter, and it tastes like lemon black tea. The Natural Process has a smooth taste. The Unwashed Process has a fermented, wine-like fragrance. After listening to his introduction, and then drinking his brewed coffee, the transparent brown liquid had a kind of mellow taste. It was unique and interesting. It made me have a little better understanding of coffee. What's even more interesting is that when guests enter the W&M Workshop, W will first observe the character of the guests, and then recommend the coffee for the guests according to the weather (sunny, cloudy or rainy days) and time (noon or afternoon). "Different weather conditions will affect the mood and taste. If a guest who likes to savor different coffees, then I will explain different items and also chat with him/her. If a guest likes quiet, then after brewing the coffee, I continue to do what I have at hand. I cherish every guest who enters the door; each is special. I enjoy every kind of different interaction with them." When Xiaoman Chen (Slow Chen) passed the Facebook page of W&M Workshop to me, what attracted me most was the poetic essays of W. Sometimes he records the weather of the day, sometimes he writes about his personal observations or shares his favorite sentences from books. It seems that W is a philosopher, or like Li Bai and Du Fu recited poems on the riverside. The coffee culture in Taiwan has developed rapidly and is diversified; there are many different types of cafes in the market. "I respect all kinds of coffee culture; for me, it's more important to decide what style of my coffee shop is. Every guest is different, but respecting each other is the basic principle." W said. Regardless of cost considerations, W&M Workshop offers basic butter cakes to entertain guests with each coffee order. M bakes cakes every day. "I resigned after my brother was ill. Since then, I have been baking cakes. Although we do not eat sweets so often, the process of baking is a kind of enjoyment, which makes me glad." When we mentioned the cake, M looked happy; I could imagine him stirring the butter and flour. But is there no problem with the cost? "As long as we can maintain basic expenses and business, we are happy, and our guests will feel it. We can influence other people from small parts, creating a good atmosphere and promoting a better quality of life." Yes, I said W is a philosopher barista. W&M Workshop is not open every day, and the no-business days are open to the public for coffee workshops. W organizes the accumulated knowledge of coffee over the past few years into a four to five hours essential workshop. "The basic content of the course is very substantial, but it will also be taught by each aptitude. If there will be a barista to join the workshop, then I will explain more and deeper. They are seeds; when they go out and face their guests, they can pass out better energy." Sharing his knowledge is his main idea of teaching. W hopes to share the spirit with people who are interested in coffee. "After ill, I changed many existing plans and principles in my life, but it also made me look at things from different points. My attitude is not as rigid as before." W acts slowly, but from our conversation, I can feel a naughty boy living in his body; moreover, he has a passion for life. He is cautious, thoughtful, which personality help him to research the coffee world deeply. Moreover, his optimistic and unconstrained attitude allow him to share the fragrance he had discovered in the coffee experience. After the interview, W handed me a bag of coffee. "It's simple. Just like a tea bag, it is the easiest way to enjoy a cup of coffee." He said to me kindly. I couldn't wait to get a cup of coffee for myself that night. The warm and rounded taste of the coffee was exactly as how he had described. The taste spread out in my mouth. After swallowing, a sweet flavor returning to the throat. My daughter used to say that the best state of a person should be like a cup of good tea, no matter whenever drink it as cold or as hot. Now I realize that life can be like a cup of good coffee as well. I also talked to W about music during our interview. I had whimsy and asked him to edit a playlist on Spotify for this interview. It could be a portrayal of his mood or a piece of music that he usually listens while working in the coffee shop. I hope that you can smell a scent of coffee while listening to the music even if you don't have coffee on your hands. All images are taken with FujiFilm X-T3, XF35mmF1.4R; it is a cooperation with FujiFilm Taiwan.